Earn 95 - 320 points upon purchasing this product. Werone's rare and unique premium red dulse (seaweed) flakes are hand harvested from the Wild Atlantic Irish Sea, then sun-or shed dried. These delicious velvety flakes help to alkalise the body and contain 10 to 20 times more bio-available minerals and vitamins than land vegetables, with zero fat and low calories, making them the perfect nutrient rich addition to any meal. Best used in conjunction with Mega Metal Detox Drink. Use 950 - 3200 points to purchase this product! Werone’s rare and unique premium Red Dulse (seaweed) flakes are hand harvested from the Wild Atlantic Irish Sea, then sun-or shed dried. These delicious velvety flakes help to alkalise the body and contain 10 to 20 times more bio-available minerals and vitamins than land vegetables, with zero fat and low calories, making them the perfect nutrient rich addition to any meal. 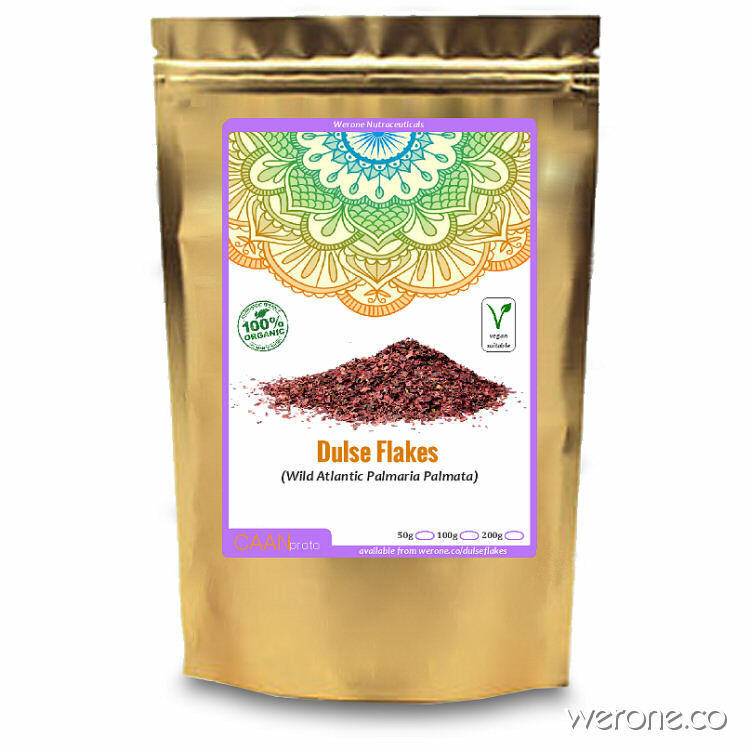 Use this Dulse with our delicious Mega Heavy Metal Detox Drink. which contains Wild Blueberry, Hawaiian Spirulina, Barley Grass Juice and either Dulse or Cilantro. You can eat Dulse on it’s own or sprinkle on salads, stir fries, soups or put in bread butter and other savory baked goods.